Lavigny’s Legion (officially The 528th Legion of the Imperial Navy) is a military cadre forged in the fiery crucible of Achenar’s first conflict with the Federation during the 2320s. Funded and fielded by the prestigious Lavigny family, those first Legionaries swiftly built a reputation for valor and ferocity in battle. For hundreds of years, the Legion has guarded the members of the royal Lavigny family. Today, Lavigny's Legion is the largest Imperial force devoted to, above all else, the well-being of the Achenar Emperor, Arissa Lavigny-Duval, her citizens, and her lands. Lavigny's Legion consists of the strongest, most dedicated Imperial commanders in the galaxy. Our Legionnaires protect Imperial freedoms whilst serving our glorious nation both in local space, the uncharted black, or in operations in hostile territory. We take pride in everything that our Emperor has graced us with; Legionnaires bleed purple to their very core. We are a large, all-inclusive Imperial player group for Elite Dangerous, with sizeable presence on all platforms, catering to all styles of play. We have a powerful BGS department; our in-game minor faction (Lavigny's Legion, based in Carthage), which is a true patronage, bolsters the Lavigny-Duval military economy, and is in control of 24 billion citizens spanning thirteen star systems.. Our group mainstreamed PvP meta by inventing silent running builds and its wing tactics, and offers an inclusive environment for PvP interested pilots to hone their skills. The Legion has always been a very involved PowerPlay group, and to this day offers various ways to be active in PowerPlay, despite its involvement elsewhere. In the Legion, no action for the emperor is too small, whether it be fueling local economies, providing exploration data for Imperial Stellar Cartography, or directly expanding/protecting the borders of our Emperor's lands. How is the Legion different from other groups? Diverse membership from around the globe. This allows Legion players to be online all the time. Our largest membership bases are American, German, and French. We offer language-specific channels for those who struggle with English. An ever-growing membership education program. Utilizing the classic wing-up, Lavigny's Legion emphasizes membership education by supplementing with materials, quizzes, and voice lectures, culminating in the infamous Logisticae Exam. A vast network of faction alliances. Players interested in furthering their narrative via other groups will find numerous opportunities through being involved in the Legion, with its diplomatic ties allowing easy exposure to numerous various groups of players and leaders. A robust, colorful communications platform based on Discord. No subject is alien in the Legion (minus the EDGE Fleet, of course), and we have channels devoted to almost anything you can think of without being overbearing to the standard IRC user. A well-established hierarchy, with clear, concise organization. The Legion operates under a parliamentary board-of-directors style leadership that strives to be open to membership recommendations and suggestions. Diverse creative opportunities. The Legion is welcoming to (and is host to) artists of any caliber. We have posted many videos on YouTube, and promulgate creative expression in our community. Okay, while that's great and all, what about in-game stuff? PowerPlay: Whether you haul cargo or endlessly fight, we can always use your skills. We fortify five designated systems in ALD space every week, and work closely with PowerPlay agents across the Empire to ensure strikes against our enemies are efficient and strong. Operating with direct representation in the Imperial High Council, the Legion works with true synergy in their operations. Background Simulation: Miners, explorers, spacefarers, haulers, and bounty hunters can find a place in working for Lavigny's Legion. Our in-game faction is an Imperial Patronage, which alleviates Imperial economic stresses when in control. Working closely with the Chapterhouse of Inquisition, our Legionnaires assist others throughout Imperial space to ensure beneficial governments are in control, and to undermine those who threaten said governments. We have exploration projects that the most starry-eyed Commander can get into. We can teach you how to use any skills for the good of the Empire. PvP: Lavigny's Legion proudly hosts the Velites Squadron, a two year-old combat organization devoted to thwarting threats both in our space and beyond. 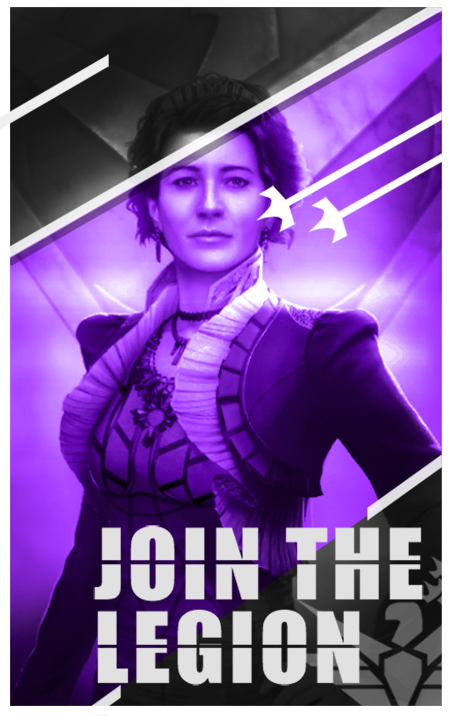 Those interested in being a part of this prestigious cadre train through the Cataphractoi Initiative, an internal program designed to make Legion PvP pilots amongst the most skilled and honorable in the Empire. The Legion is home to many pilots who learn together to test their mettle against other skilled pilots. Lavigny's Legion has a rich, time-honored canon lore going back to the 24th Century. We pride ourselves in both Legion and Imperial lore, canon or not. If roleplay is your style, look no further. If it's not, that's fine! We always coordinate very closely with numerous cross-power combat/BGS/PvP initiatives, issuing curated orders for our members that have been discussed in length with various analysts and leaders. Legion Lore has presented in many places throughout Elite (this can be viewed in detail in the “Documents” tab above). We are canonically headquartered in Carthage, and have three Majestic Class Interdictors in system, most notably the Legion flagship, the LLV Charybdis. This group holds representation in both ALD Research and the Imperial High Council, a gathering of prominent Imperial player-made faction leaders and coordinators. Lavigny's Legion hat auch eine engagierte, deutschsprachige Spielergruppe, die sich regelmäßig im Voicechat und ingame zusammenfindet. Schließt Euch uns an! Lavigny's Legion a aussi un groupe parlant Français! Rejoignez-nous! 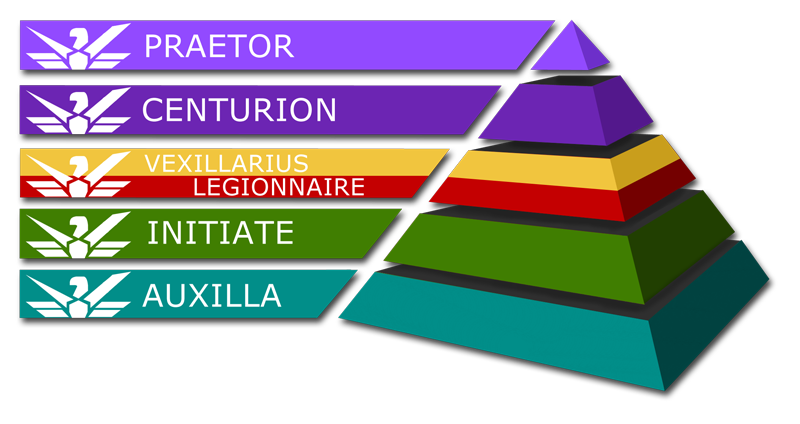 The Legion runs on a typical hierarchal ladder with a leadership council. The image above shows a pyramid in descending order of executive power and relative playerbase. Read on to learn about what each rank denotes, starting with Initiate. If you are part of another group and you wish to join the Legion, now you can! The Auxilla Corps is a special rank of Initiate that allows people from other groups to join the Legion if they wish to stay in their other group. However, you will be denied membership if you share a group with Federal, Pirate and those who intend to harm the Empire. As you apply to join the Legion, you will be immediately initiated via a short text-based roleplay ceremony, at which point you will hold the rank of Initiate. Here, your membership is tested, and you will gain access to our #barracks channel in Discord where you will be able to coordinate with other members of the Legion. In essence, this rank only expresses a desire to join. It is still encouraged to wing up with your fellow members and get a feel for the Legion. Upon flying continuously with our other members, devoting your time to Imperial activities, and completing educational study with the Logisticae Cohort, the Legion’s full members as a whole will determine if you are worthy to ascend into the rank of Legionnaire, cementing your place as a member in full standing. You will have full access to our orders as well as additional coordination channels. This rank consists of the majority of Legion members. Members who have served with the Legion for quite a long time and have done actions worthy of higher merit, whether it be in administrative duties, combat, extended PowerPlay direction/coordination, or other Imperial actions of note, hold the position of Centurion. These are members who have shown not only that they are exceptional at what they do but they are willing and able to take on the added responsibilities associated with leadership. Named after the ancient Roman Legion unit that commanded a hundred Legionaries, Centurions often lead many Legionnaires and have the authority to direct members and offer input in matters of executive nature. Finally, Praetors are the leaders of Lavigny’s Legion who have shown great integrity character, leadership and skill on multiple occasions and have demonstrated superior diplomatic and logistical prowess. While Praetors may not necessarily be more powerful in-game than others, they have devoted their time to both administrate and coordinate the Legion and thus hold positions of leadership. Praetors all have equal executive power and as such convene in a Council to discuss the various goings of the group. Vexillarius is one of the special Legionnaire ranks (thus not above Legionnaires militarily), the members of which have shown great dedication to Lavigny’s Legion. Either through combat, trade, exploration or research; these members have gone above and beyond to be true examples of what we want to see in the Legion. New and old members alike would be remiss to ignore the integrity of these Legionnaires. Vexillarius is the latin term for "standard bearer" or "flag bearer", and we found it most appropriate for our excellent members. Immuni are retired leaders. These are members who have, whether it be voluntarily or in connection to a long absence, relinquished their command within the Legion. They remain active, however, and remain valuable advisors to the Legion. For example, one of our Elders (founders of the Legion), CMDR Ender Wiggins, currently holds this rank..
Quaestor is a special Centurion who primarily focuses on ways to help and lead in a non-combat capacity. This could be helping manage/moderate communications channels, maintaining the integrity of our site/roster, assisting in networking ventures, or performing research. One could even perform reconnaissance into enemy territory or search out the best trade/fortify routes. Legate is a combat veteran rank given through Centurion. Legates are considered among the best of the best in the world of combat, whether it be as tacticians or (more commonly) as PvP pilots. Regardless of the situation, it is the Legates that the Legion turns to in times of war. We communicate primarily through our Discord server and are very welcoming to new members or visitors. We have friendly relations with many other factions and independent pilots throughout human space. As a traditionally neutral Imperial faction, Lavigny's Legion enjoys diplomatic neutrality with foreign groups, and are intrinsically abhorrent to Federal values. We take pride within our membership to uphold Imperial values. Pop into our Discord and say hello! Thanks for getting this far! If you would like to join, please apply by requesting to join on the right and entering our Discord server. For hundreds of years, Lavigny's Legion has served as the private guard of the Lavigny family. As the Emperors personal force, we of the Legion strike against any and all enemies of her Majesty and strive to bring security and peace to all Imperial citizens. By doing so we bring honor to the Empire and help those around us to a better, more secure life. Lavigny's Legion is a multi-lingual, all-platform, Imperial player group for any type of player; casual or professional, new pilot or bitter veteran. Operating mainly in the widely-used chat platform Discord, Lavigny's Legion is a well-connected community boasting numerous diplomatic ties, coordinated efforts, and a colorful, active atmosphere.